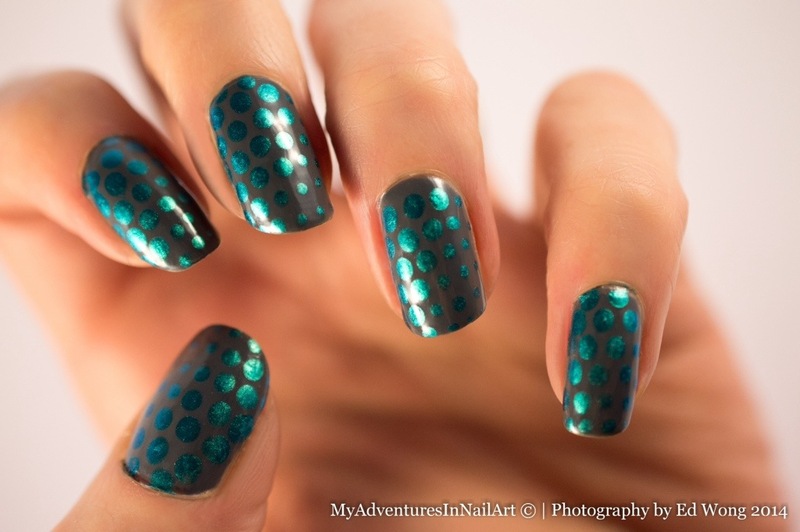 My idea for this one was to do a kind of gradient of dot sizes from big fat ones at one corner of the nail to little tiny ones in the opposite corner. The size gradient didn’t come out as clearly as I’d hoped it would but I still love the combination of these two polishes, and that is after all what this challenge is about – rediscovering old polishes that you love! I think these were the first two polishes I bought after moving to Spain in October 2012 and I’d never heard of the makeup brand GOSH before. I don’t think they’re a massively popular brand but they have some lovely bright colours and are sold in quite a lot of cosmetics stores in Spain. So a great colour combination, but I think I’ll come back and try the design again another time and rethink how to make it more striking looking. I recently joined a Twin Post group which is new for me and I really like the idea of collaborating with other bloggers. This month’s theme for the group is Patterns and my twin blogger Stefanie from Fairly Charming and I were assigned abstract as our style of pattern. I was a bit puzzled as to what to do with this very open them to begin with but Stefanie suggested doing something very free and unplanned. I loved the idea and thought we also needed something to tie our ideas together so we were still creating twinned manis. 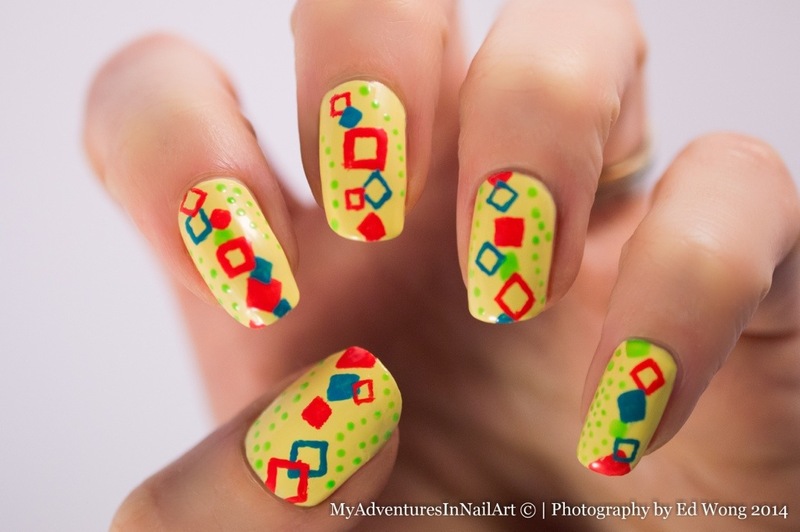 We decided on bright (possibly neon) colours, dots and squares to create a spontaneous abstract pattern each. I tried a neon yellow base first but the neon yellow looked so horrible with my skin tone I opted for a bright yellow creme instead. So here’s what I came up with! I was quite pleased with the result and felt it was my first proper bit of nail art for this year and my free-handing skills will only improve if I give myself challenges like this! Looking forward to next month’s! I got loads of new polishes over Christmas and New Year as gifts from family (and gifts to myself!) My husband bought me the set of minis from the OPI San Francisco collection so I thought I’d use them for a simple ruffian mani while trying to get myself back into nail art after a bit of a break. I’m not all that into red polishes but started with a base colour of First Date at the Golden Gate. Note to self: red is not a good choice for the base layer of a ruffian mani – it looks like red raw sore cuticles from a distance! 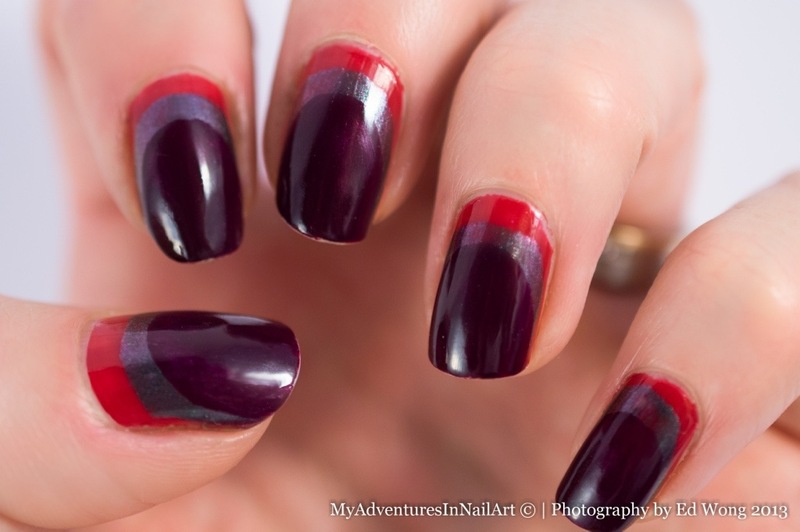 I liked this red and can see myself using it in nail art in the future. Next I added a layer of Peace, Love and OPI which is the polish I was most excited about in the collection. It was very pretty but quite thin, I’m looking forward to trying it on its own to see how it looks without bits of red showing through next time. My final layer was of In the Cable Car-Pool Lane which is a gorgeous burgundy with great coverage. I wasn’t that excited when I saw it in the bottle but loved it once I got it on my nails! Maybe not my neatest or most perfect manicure but good to get me back into the habit while waiting for my nails to grow back after them getting into a sorry sorry state in the freezing conditions of North Finland and the Pyrenees on my wedding and honeymoon! It’s been a while since my last post as I’ve been away on my honeymoon and I feel like I haven’t done any nail art for absolutely ages. So a slightly belated New Year’s Resolution is to get my blog sorted out and get back to posting a bit more regularly. What better way to get myself motivated than to throw myself into a challenge!?! 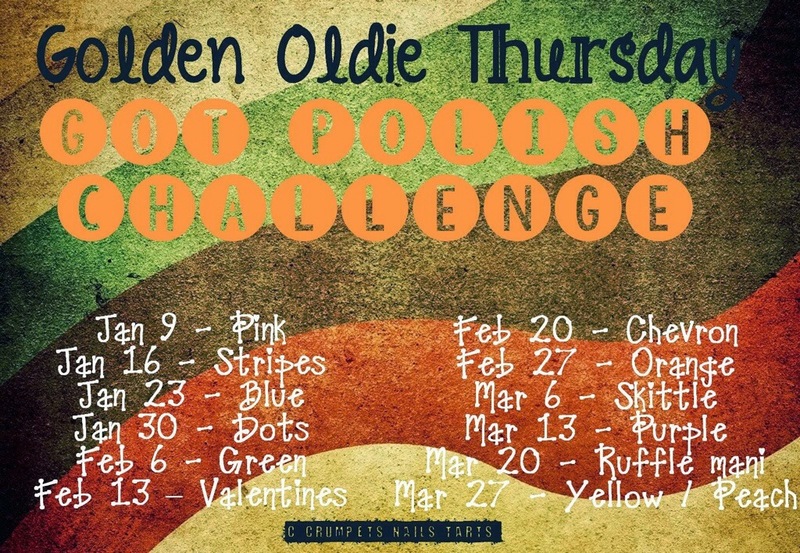 I’m joining this one a bit late and have missed the first two weeks of it (I may try and catch up with those first two weeks’ themes when I have time). This one is being run by Crumpet’s Nail Tarts and involves using polishes you’ve owned for more than a year. I’m not actually sure when I bought a lot of my polishes but I’m going to try to only use those that I believe I’ve owned for that long! My first effort isn’t spectacular but does feature a blue polish that I’ve always been very fond of. I bought it when I still lived in Japan and was first getting interested in nail art. It’s not a brand I’ve seen available in Spain so when it’s gone there’ll be no replacing it. 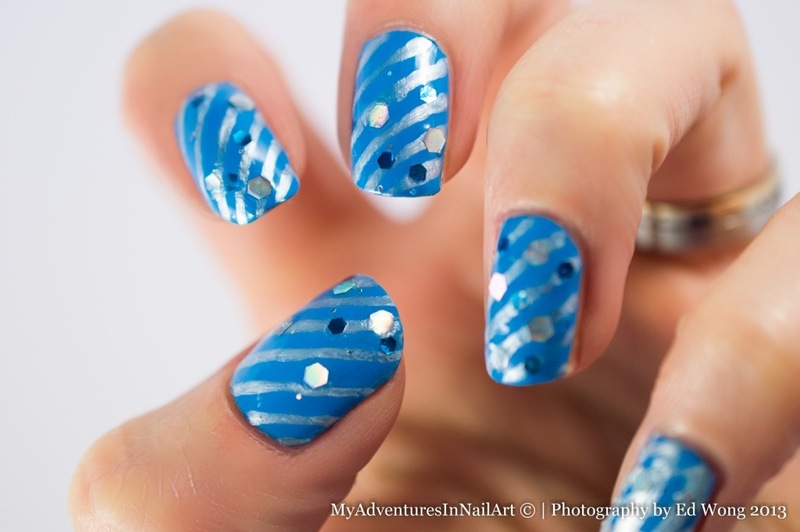 The glitter is one I’ve never had much luck with and requires a lot of fishing and coaxing of the larger pieces into the right place – I’ve always wanted to love this polish but it’s a bit frustrating to use! I thought this mani would come out looking more fun than it did, but this is the first bit of nail art I’ve done in quite a while so I can’t expect it to be my best work!